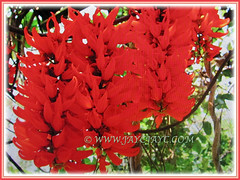 New Guinea Creeper of Red Jade Vine is an exotic and magnificent tropical climber with amazing clusters of bright orange-red flowers. The colour of its chandelier-like clusters of blossoms is absolutely stunning and unique. Grow this beauty if you can provide space and a strong support such as an arbour or trellis. 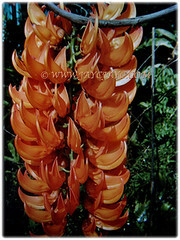 Botanical Name: Mucuna bennettii (syn. : Mucana albertisii, Mucana novoguineensis). 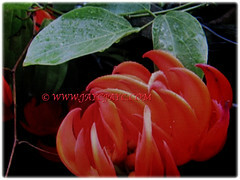 Common Names: New Guinea Creeper, Scarlet Jade Vine, Red Jade Vine. Etymology: The genus Mucana is the Brazilian vernacular name for cow-itch which is Mucana pruriens. The specific epithet bennettii is named after A.W. Bennett, a British botanist. 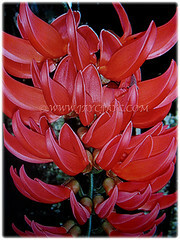 Origin: Native to Papua New Guinea. It is popularly cultivated worldwide. Plant type: An ornamental, perennial and tropical climber. Features: Mucuna bennettii is from the genus, Mucuna that consists of about 100 accepted species of climbing vines. A large and fast-growing woody and twining climber that can grow up to 30.48 m in length. It will eventually grow to a big climber and requires a large space to spread. Ensure its roots are in shade. The vine will be covered with glossy green and trifoliate leaves with ovate-shaped leaflets. Leaves are alternately arranged along the stem. 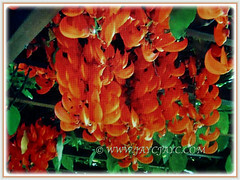 Beautiful chandelier-like clusters of bright orange-red flowers are produced in a metre long raceme. Eventually, the flowers will be followed by short, oblong and fleshy seedpods. 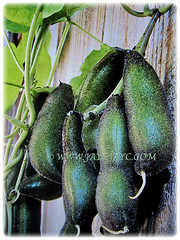 Culture (Care): Mucuna bennettii or New Guinea Creeper can be easily grown with minimum care. Light: Best in full sun or bright filtered sunlight for optimum growth and flowering. Does well in semi-shade too. Water regularly to keep the plant moist but never waterlogged as it is prone to root rot in soggy soil. 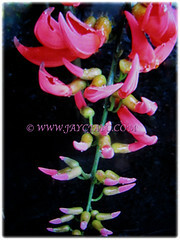 Others: Prune the Red Jade Vine lightly after blooming. Since the plant blooms on both old and new growth, do not hard prune as it will delay flowering. Lack of water may cause leaf browning and stunted growth. Provide the vine with a strong support such as a pergola as it will become a large and woody climber. Feed once fortnightly with a balanced fertilizer for flowering plants at ½ strength. Generally free from serious pests and disease problems. However, do watch out for mealybugs, aphids and spider mites. 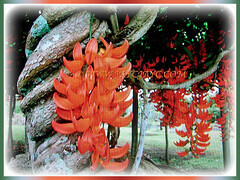 Mucuna bennettii or New Guinea Creeper is a tropical plant and will also thrive well in semi-tropical regions. It requires warmth and the plant is likely to turn yellow and drop its leaves if temperature drop below 13°C. It benefits when its roots are in full shade. Just cover the roots with a layer of mulch around the base of the plant. Replenish mulch as required to keep its roots cool. In non-hardy regions, grow this beauty in a greenhouse or conservatory with sufficient light. If it is planted in a large pot/tub, you can prune it back after flowering and bring it to overwinter indoors. Feed the plant once fortnightly with a high phosphorus fertiliser in early spring to promote flowering throughout summer and fall. Propagation: Can be propagated from stem tip cuttings. 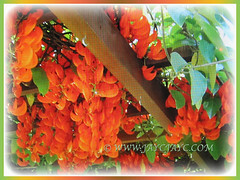 Usage: Mucuna bennettii or New Guinea Creeper produces beautiful clusters of bright red-orange flowers and will be excellent over a pergola, trellis and arbour to display the spectacular cascading flower trusses. A beautiful climber with ornamental flowers that can be trained to climb large trees. Suitable to be grown in a very large container or tub and ideal to be planted in the ground with a strong support such as a pergola for it to climb. It’ll make a great accent specimen in any garden. Grow it if you’re a nature lover as this beauty attracts butterflies and hummingbirds. Its cousin, Strongylodon macrobotys is as beautiful with spectacular claw-shaped flowers in shimmering greenish-blue. 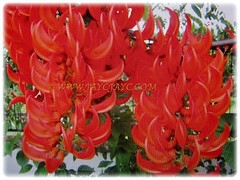 I reside in South Africa and am trying to source the Mucuna bennettii Scarlet Jade vine for a friend. Can you perhaps assist. Kind Regards.